Are you ready to do the best work of your career? We believe that work—and the college admissions process—should be exciting, rewarding, and even fun. 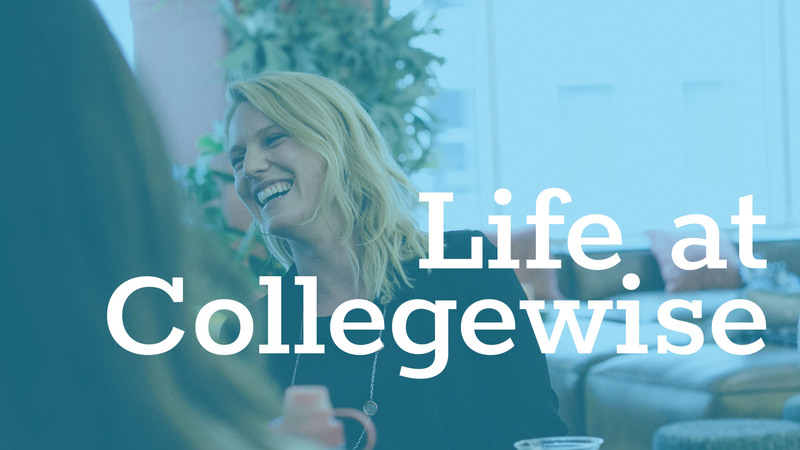 Like a dorm at your favorite college, Collegewise is full of smart, fascinating folks bonded by a desire to get the most out of our time here together. Collegewisers are artists, chefs, chemists, churchgoers, dancers, first-gen college grads, gamers, horseback riders, marathoners, musicians, parents, philanthropists, pizza lovers, public speakers, readers, reality TV watchers, sports fans, triathletes, travelers, writers, and yoga instructors. We all come from different backgrounds, experiences, and careers, but we share similar goals: do work we’re proud of, offer the best college counseling in the business, learn, tell the truth, treat people right, make an impact, have fun, and do it all with people we like and trust. Together, we’ve been making a dent in the college admissions universe since 1999. And we feel like we’re still just getting started. Are you (and your work) missed at your former gigs? Let’s talk. People who bring their heart to work thrive at Collegewise. If you’re a curious, kind, thoughtful, likeable human being who makes work a way of life without making it your actual life, you just might find a professional home here. But these common values and goals don’t mean that we’re just looking for clones of ourselves. In fact, when we look at our group photos, we see too many similar faces staring back. Diversity makes us better counselors, better representatives of the values we espouse, and better human beings. So if you look through our counselor bios and don’t see yourself, please don’t pass us by. Come join us. We’ll do some learning and growing together. We built the company we’d want to join. Company culture isn’t a mission statement or a banner on the wall; culture makes itself based on what a company actually does. Here are a few things Collegewise does every day. Our training doesn’t stop with making sure you have the knowledge and materials needed to do your job right. Everyone at Collegewise is invited to join our regular webinars and in-person trainings presented by our most experienced Collegewisers. And we each have our own professional development budget to spend however we see fit. It feels good to always be getting better at something that matters, and you’ll have plenty of opportunities to learn and grow in your career here. We aren’t just open to hearing feedback from everyone at Collegewise—we regularly ask for it. In fact, some of the things we love most about working at Collegewise, including our “Summer Friday” hours, exist because our leadership had the good sense to listen to the Collegewisers who suggested them. A supportive, connected "work hive"
No matter where you live, you’ll have opportunities to work, learn, and play with the people who make us who we are. Collegewisers form their own projects and teams, like the OCTF (Oxford Comma Task Force), the monthly “Inside the Hive” newsletter, and the book club for Collegewise bookworms. And once a year at our company meetup, we all come together in places like Austin, Cancun, and Sedona. We admit it… we like sharing. From our presentations at high schools and conferences, to our free resources for families and counselors, to the advice our founder shares every day on his blog —when we’re not helping our students, we’ve got unlimited intellectual capital to offer to anyone who wants it (yes, including our competition). Our handbook is public. Read our employee handbook for an insider’s view of Collegewise. Collegewise offers 10 days of paid vacation, a one-week winter break, a floating week of additional time off, and a few national holidays every year. This is a guideline, so when you need to take a sick or personal day, don’t sweat it. After 12 months and 1,000 hours worked, full-time employees are eligible for our 401(k) program with company matching. When you welcome a new child (birth or adopted), Collegewise encourages parents, spouses, and partners—regardless of gender or primary caregiver status—to take up to 6 weeks paid leave. We also encourage birthing parents to take additional paid medical leave of up to 6 weeks. Collegewise offers a full suite of medical, dental, and vision benefits. On Fridays during the summer months, our offices close at 1 p.m.
Don't see the right position for you right now? Get notified when the right position opens up.